This article compares the telecommunications consumer dispute resolution scheme in Australia, Japan and Korea based on the telecommunications consumer policy principles developed by the Organisation for Economic Co-operation and Development (OECD) in 2011 and the guidelines and recommendations developed by the International Telecommunications Union (ITU) in 2013. This article concludes that the Australian consumer dispute resolution scheme (the Telecommunications Industry Ombudsman scheme) appears to be the best practice among these three jurisdictions studied, followed by the consumer scheme in Korea. Both the current Japanese scheme and the proposed new scheme in Japan appear to be less appropriate due to the foreseeable inadequate accessibility and insufficient consumer redress authority created under the scheme. Nonetheless, much experience and exceptional practices can all be shared and learned by the regulatory decision-makers in all three countries. Over the last decade, the communications sector has been subject to transformation with the development of competition and the diffusion of a range of new technologies and services. Competition has brought significant benefits to consumers with falling prices, better quality of services, a wider choice of service providers, and easier access to new services. Technological and service developments have resulted in electronic communications becoming a central feature in many countries around the globe, and this will become even more so as next-generation communication infrastructures and services are put into place. The significant benefits to consumers in the development of new services and technologies has also had some costs, as consumers have been faced with more complex choices, a range of offers (sometimes with unclear pricing structures) and contracts which at times limited the flexibility of consumers (OECD, 2008). The emphasis on creating competition in communication markets has been mainly through supply-side measures but, in recent years, there has been more recognition that informed and empowered consumers can, through demand-side choices, stimulate firms to innovate, improve quality and compete in pricing. By making well-informed choices between suppliers, consumers not only benefit from competition, but they drive and sustain it. At the same time, as the use of communication services has increased, more emphasis is being placed on reviewing consumer policy relating to communication services by supplementing the range of consumer measures to provide better protection, more flexibility in the market for consumers, and better access to information (OECD, 2008). It is in this context that the Organisation for Economic Co-operation and Development (OECD) has developed a set of policy principles for ensuring that consumer interests in communication services are adequately protected. The principles recognise that it is necessary to ensure transparent and effective consumer protection while maintaining an environment that provides incentives for investing in developing new communication services (OECD, 2011). In 2007, the OECD published a Recommendation on Consumer Dispute Resolution and Redress (OECD, 2007) in which member countries are recommended to review their existing dispute resolution and redress frameworks to ensure that they provide consumers with access to fair, easy to use, timely and effective dispute resolution and redress without unnecessary cost or burden. It also required member countries to ensure their domestic frameworks provide for a combination of different mechanisms for dispute resolution and redress in order to respond to the varying nature and characteristics of consumers (OECD, 2007: pp. 9 ? 10). Against this background, this article examines the communications consumer dispute resolution and redress in Australia by comparing it with consumer schemes in two other OECD member countries in Asia: Japan and Korea. Japan and Korea are chosen as comparators for two reasons. Firstly, both Japan and Korea have achieved fast development of their communications industry in recent years. Although the population in Australia is smaller than those of Japan and Korea, the Internet penetration rates in these countries are indeed comparable, and similarly with fixed-line phone and mobile phone penetration. In particular, the fixed-line telephone penetration in Australia was 44% in 2013, while it was 47% in Japan and 50% in Korea in the same year (International Telecommunications Union, ITU, 2013a). In 2013, the Internet penetration by individuals in Australia was 83%; it was 86% in Japan and 85% in Korea (ITU, 2013c). In addition, all three countries have a high level of mobile phone take up. It was 130% in Australia (ITU, 2013b). These figures (the high penetration rates) present a comparable level of development in the telecommunications sector between Australia, Japan and Korea. A higher level of penetration suggests a larger communications consumer population in the market. The figures above are significant. They indicate that the communications consumer populations in these three countries have grown much larger than the entire populations of the respective countries. The topic of communications consumer protection is therefore becoming an area of regulation attracting attention from every aspect of people's lives. The following part of this paper, Part 2, aims to provide an analysis of the current communications consumer dispute resolution and redress schemes in these three countries. Part 3 analyses and evaluates these schemes against the OECD Policy Guidance for Protecting and Empowering Consumers in Communications Services. Part 4 concludes that all three countries have in place certain schemes responding to OECD principles to various levels; however the schemes are significantly different in all these countries regarding scheme set-up, authority, operation process and procedure. Australia?s scheme appears to be the best practice among these three countries, followed by the scheme in Korea. Both the current Japanese scheme and the proposed new scheme appear to be less appropriate due to the foreseeable inadequate accessibility and insufficient consumer redress authority created under the scheme. Nonetheless, much experience and excellent practices can all be shared and learned by the regulatory decision-makers in these countries. This investigation consists of two main activities. The first activity is a desk research investigating the current schemes. The second activity is a series of one-on-one depth interviews to verify and supplement the findings from the desk research (mainly due to the lack of public information in English in Japan and Korea). In order to compensate for the limited sample size in using depth interviews, interview participants were carefully selected from regulators, the communications industry (major companies), consumer law attorneys, and academia in both Japan and Korea. A total of seven interviews were carried out during September and October 2014. Interviews in Japan were conducted with the Japanese communications industry regulator, the Ministry of Internal Affairs and Communications (MIC) (Kamiya, 2014), the two largest Japanese telecommunications companies (NTT East and DoCoMo) (Oonawa et al, 2014), one Professor specialising in communication policy from the Institute for Media and Communications Research, Keio University (Sugaya & Higashihira 2014), one major Internet Service Provider (Biglobe) (Yoshiyuki et al, 2014), and two legal professionals specialising in communications consumer protection (Takahashi & Arimoto, 2014). Interviews in Korea were conducted with SKT, the biggest telecommunications company in Korea, (Choi & Tae Kim, 2014); two Professors specialising in communication policy: one from Inha University (D. (Kim, 2014) and the other from Hallym University (Ahn, 2014); and one specialised communication attorney (Choi, 2014). The three countries exhibit three very different systems with various different stakeholders in each system playing different roles and functions. In order to present a clear picture in an easy-to-understand fashion, findings from both the desk research and interviews are combined and compared in the following parts of this paper. Being the world?s first industry-specific ombudsman scheme, Australia?s Telecommunications Industry Ombudsman (TIO) was established in 1993 to provide an alternative dispute resolution service between carriage service providers (CSPs) and consumers. The TIO is authorised under Part 6 of the Telecommunications (Consumer Protection and Service Standards) Act 1999 to provide a free and independent dispute resolution service for small businesses and residential consumers in Australia who have complaints about their services. The industry regulator, the Australian Communications and Media Authority (ACMA), is only involved in consumer disputes when non-compliance issues occur. To use the TIO scheme, the complainant, being either a residential consumer or a small business (TIO, 2015j) should have a complaint relating to a landline telephone, mobile or internet service, or damage to property or telecommunications equipment. The complainant needs to contact the service provider to attempt to solve the complaint with them before taking the matter to the TIO. The complaint matter has to be less than two years old (TIO, 2015a). Once the TIO accepts the complaint, a case officer will be allocated and will be responsible for handling the compliant until a final decision is made. The TIO has the authority to decide the resolution of a complaint up to AUD$50,000, and to make recommendations on complaints up to AUD$100,000. Australian telecommunications companies are legally obliged to join the TIO scheme (TIO, 2015g). 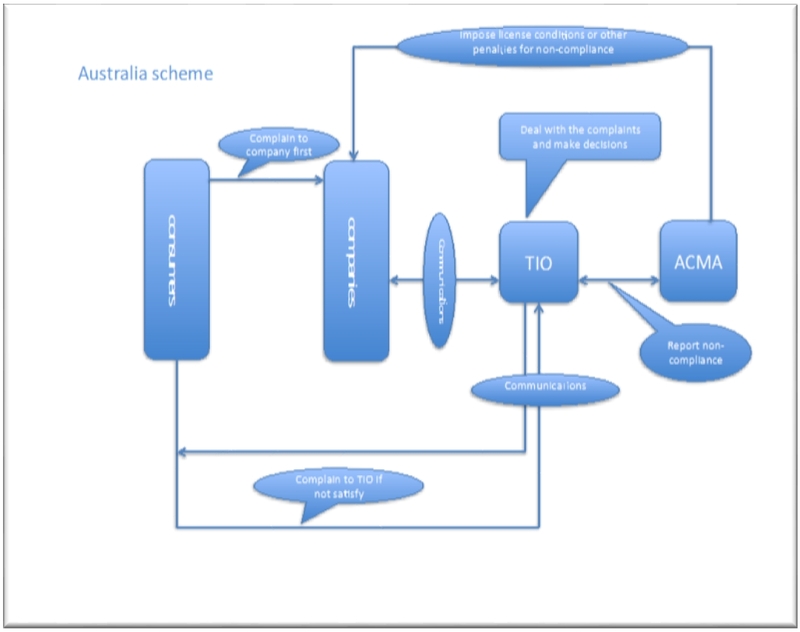 Figure 1 below illustrates the position of the TIO in consumer dispute resolution in Australia and the complaint-handling process. When forming any view, assessing any evidence, or making any decision, the TIO must have regard to what is ?fair and reasonable? (TIO, 2014d). To use this scheme, small business as defined by the TIO includes any business that usually has up to 20 full-time employees and $3,000,000 annual turnover (TIO, 2015h). The complainant is required to complain to the provider and to give the provider a chance to consider the complaint matter before the TIO can accept the complaint. However, the period that the complainant needs to deal with the service provider before taking the matter to the TIO is not specified in the TIO?s Constitution and Terms of Reference (TIO, 2014c). The TIO?s resolution becomes a binding decision to the provider if the decision is accepted by the consumer within 21 days from the date when the decision is made. The acceptance of the TIO?s resolution prohibits consumers from taking any further action against the provider about the same complaint matter (TIO, 2014a). During the TIO?s complaint-handling process, providers are normally prohibited from taking legal action in a court, tribunal or alternative dispute resolution forum about the complaint matter (TIO, 2014b); there is a timeframe of 15 business days to follow the course of action outlined in the TIO?s decision by the provider after the consumer accepts the decision (TIO, 2014c). Non-compliance matters are normally referred to the industry regulator, the ACMA, and (might) be published in various forums such as the TIO Annual Report, the TIO website, or a Member News bulletin (TIO, 2015c). The entire process is free of charge for consumers. The TIO sources its funding solely from its member companies who are charged fees for using complaint resolution services provided by the TIO. The funding system acts as an incentive for service providers to keep complaints made to TIO to a minimum, as service providers are only charged if the TIO receives a complaint from one of their customers (TIO, 2015d). In Japan, dispute resolution for communications consumers operates in a very different structure, as there is no TIO-like middle person who can make binding decisions on consumer matters. Instead, disputes between consumers and service providers are mainly negotiated and agreed between the parties themselves. 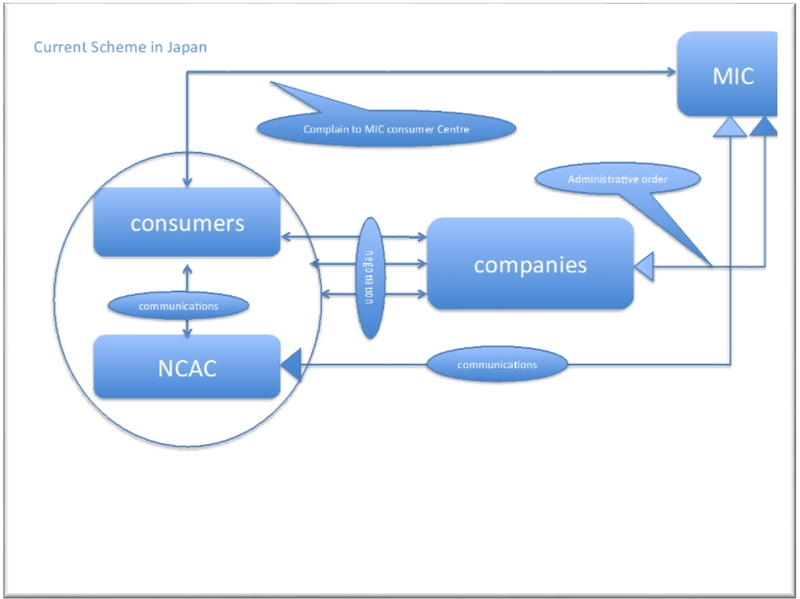 In negotiating a dispute with a service provider, an individual consumer can seek help from the National Consumer Affairs Centre of Japan (NCAC) or even make direct calls to the Japanese communication industry regulator, the Ministry of Internal Affairs and Communications (MIC). The NCAC is established as an independent administrative agency. It works as a core consumer advocate in Japan (NCAC, 2003a). The main activities of NCAC include consumer information collection (analysis and release) as well as consumer consultation. It is a general consumer body dealing with consumer issues across all sectors involving communications-related issues. It also trains consumer counsellors nationwide (NCAC, 2003b). A main function of NCAC is to help consumers to deal with issues with their service providers, but it does not have any legal authority to make a decision on the matter. In addition, the MIC also set up a consumer centre to receive phone calls or written complaints from individual consumers and/or consumer counsellors. This centre is called the MIC Consumer Inquiries Centre. It works as the complaint and consultation reception desk of the Telecommunications Consumer Policy Division in the MIC to respond to complaints and consultations, inquiries from institutions such as the NCAC, and fact checks with the telecommunications carriers and departments concerned, and requests for appropriate measures to be made by them. However, this consumer inquiries centre does not deal with private issues from individuals in general; although it can issue administrative orders to telecommunication companies, but this measure is rarely used. More often, the Consumer Inquiries Centre sends direct requests to companies ordering them to improve the level of their consumer services when a large number of complaints are made against them (Kamiya, 2014). Figure 2 below illustrates the current Japanese system. This process is mainly a straightforward private negotiation process between consumers (sometimes with the assistance of NCAC counsellors) and service providers (companies). NCAC?s role is purely to assist consumer negotiation in this process. The MIC?s role is also very limited with regard to its direct involvement in individual consumer matters. The Japanese system is nonetheless starting to change due to the fact that ?the number of complaints in telecommunications business is increasing in Japan in recent years? and ?the consumer commission requested the MIC to consider a law amendment to target this issue? (Kamiya, 2014). Statistically, the total number of telecommunications related complaints and queries received by the MIC Consumer Inquiries Centre decreased continuously over the past decade from a total of 16,101 in 2004 to a total of 6,811 in 2012 (Kamiya, 2014). This trend is however characterised by an increasing number of cases based on terms and conditions agreed with the service providers, an increasing number of cases on the quality of communications service, and cases on sales activities, including telemarketing. In particular, consumer complaints relating to terms and conditions agreed with service providers have been ranked the number-one complaint matter in the past few years, and complaints relating to quality of service have jumped from being outside the top 10 in 2010 to ranking in 9th place in 2011 and in 6th place in 2012. In contrast, the statistics from the NCAC present a very different trend, indicating a clear increase of communications-related consumer complaints in the past few years with a total number of 35,189 complaints in 2011 and 46,409 complaints in 2013. The top ranked complaint matter is however the same ? agreed terms and conditions (NCAC, 2014). The Consumer Support Centre in the middle of the diagram is a new body, to be jointly set up by the communications industry in Japan. Once formed, this body is to carry out specific tasks including exchange of information among companies, collecting and analysing typical complaints, setting up a guideline for the complaint-handling process, and communicating with external agencies such as the NCAC and the MIC. As indicated, the Japanese Telecommunication Carriers Association (TCA) is currently being considered as the vehicle in the new framework. The TCA was established in 1987 with the aim of contributing to the sound growth of the industry and improving convenience for the public by addressing common issues faced by carriers. Membership of the TCA is voluntary for companies. It now has 57 companies including all the leading service providers in Japan such as NTT DOCOMO and Softbank (TCA, 2014). Korea?s telecommunications consumer scheme is mid-way between the Australian TIO scheme and the Japanese scheme, as there is no particular third party complaint-handling scheme in the industry. However there is the Korean Consumer Agency (KCA), which acts as a middle person to solve disputes in all service fields and which also makes recommendations to the parties involved in the dispute. The KCA is a government organisation established in 1987 based on the Korean Consumer Protection Act. The KCA?s role is to protect consumer rights and interests and to promote a rational consumption life in all service fields including ICT (KCA, 2013b). Consumer counselling and dispute resolution are two major functions of the KCA together with other functions such as policy research, consumer education and publication and information disclosure (KCA, 2013d). There are two separate teams directly dealing with consumer issues: the Consumer Counselling Team (CCT) and the Consumer Dispute Settlement Commission (CDSC) within the KCA. The CCT provides counselling services to consumers encountering problems using products or services, helps consumers to negotiate with service providers, and recommends conciliation when needed. The CDSC has a quasi-judicial power. If the parties in a dispute fail to accept the recommendation made by the CCT, the CDSC can conduct mediation and also make a decision on the dispute matter. If both parties accept the decision by the CDSC, the decision will have the same judicial effect as a court of law. If one or both parties do not accept the decision, civil suits can be filed. In cases where the companies fail to comply, the KCA assists consumers in commencing civil litigation, and 30 attorneys have been appointed currently to provide legal assistance. If the case is won in court, the consumers partially pay for the attorney fee. If the case is lost, the consumers don?t have to bear the cost (KCA, 2013a). The KCA has been the principal dispute resolution method for Korean nationals for years with its scale of operation and good reputation. The new Korean government began its role in 2013 with 17 Ministries, 3 Departments and 18 Agencies compared to the former government?s 15 Ministries, 2 Departments and 17 Agencies. The Ministry of Science, ICT & Future Planning (MSIP) and the Korea Communications Commission (KCC) are the two main government bodies that govern ICT-related businesses (Koo, 2013). Therefore, communications consumers can also report their matters to the KCC and the MSIP in addition to the KCA scheme, although the MSIP oversights the industry development as a whole but does not make decisions on individual consumer matters (Ministry of Science, ICT and Future Planning, n.d.). Figure 4 below illustrates the Korean scheme. The OECD Consumer Dispute Resolution and Redress Recommendation was published in 2007 and made a series of recommendations to its member countries for them to take into account the need to improve awareness of and access to dispute resolution and redress mechanisms and to enhance the effectiveness of consumer remedies in cross-border disputes (OECD, 2007). The OECD Policy Guidance for Protecting and Empowering Consumers in Communications Services was published one year after the 2008 OECD Ministerial Meeting on the Future of the Internet Economy. This policy guidance highlights the fact that communications consumers may be reluctant to take legal action when they have serious disputes with their service provider, either because of the time and expense involved and/or because they find the judicial process intimidating. In addition, this policy reinforces the importance for communications consumers to have access to fair, easy-to-use, timely, effective and inexpensive dispute resolution and redress mechanisms, including, where possible, alternative dispute resolution services. Once again, the 2007 OECD Consumer Dispute Resolution and Redress Recommendation is cited as good practice for communications consumer protection (OECD, 2008). ensuring the consumer scheme has a wider role and functions (wider roles/functions). The following part of this paper analyses and evaluates the three schemes against these OECD recommendations. The OECD Guidance suggests to set either up an alternative dispute resolution scheme (ADR) or a simplified court procedure for small claims. The scheme should be easy to use with sufficient information disclosure, and should not impose any cost for consumers. It should also consider the special needs of disadvantaged or vulnerable populations. The Australian TIO scheme is good practice in this regard. The scheme is free to use for consumers. The service benchmark used in the TIO is the Benchmarks for Industry-based Customer Dispute Resolution Schemes, in which accessibility is the number one principle (Ellison, 1997). In addition, the TIO has been working effectively to improve awareness of and accessibility to its office. Consumers can access the TIO?s service by various different methods including telephone, post, and website. Translation and interpreting services are made available to consumers free of charge. The TIO introduced a new, more user-friendly website in 2012 and has seen an increasing number of consumers report their complaints to the TIO using the online portal (Cohen, 2013). The TIO?s website is designed to make content accessible to a wider range of people with disabilities, including blindness and low vision, deafness and hearing loss, learning disabilities, cognitive limitations, limited movement, speech disabilities, photosensitivity and combinations of these. Moreover, the TIO provides a national relay service and a teletypewriter (TIO, 2015f). The current scheme in Japan relies heavily upon private negotiation between the consumer and service provider. The NCAC?s role and function is limited to a mere ?helper? and the MIC?s role does not focus on solving individual consumer complaints. It is therefore hard to say that there is a current ?scheme? in solving consumer disputes with service providers. The proposed scheme is currently being considered by the industry, in which an industry-specific consumer support centre is to be created to handle consumer complaints. In the author?s opinion, even with the eventuation of the industry consumer support centre, the ?easy to use? and the ?accessibility? benefits are still doubtful due to the following two reasons. Firstly, the current proposal is a highly complicated framework with many parties playing different (but sometimes overlapping) roles. This is highly likely to create confusion to consumers as to the process of complaint handling. 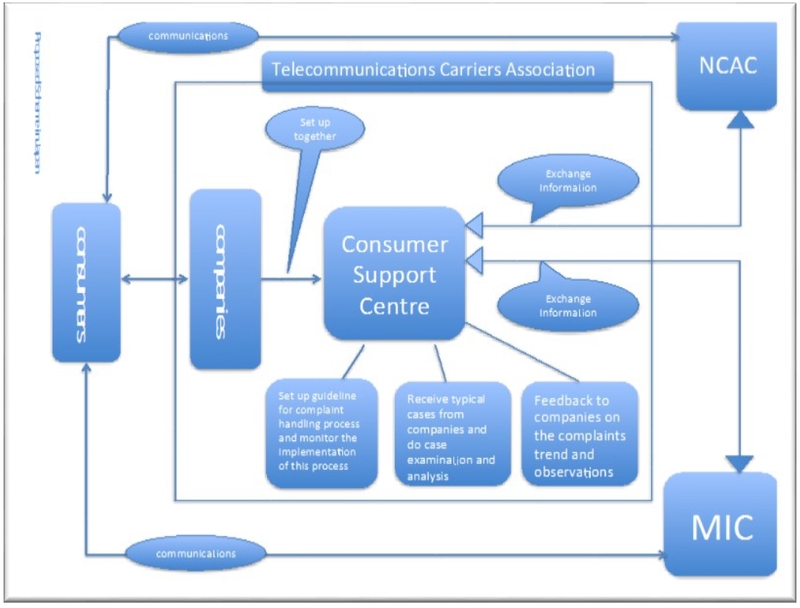 Secondly, in the proposed scheme there are three different contact points where consumers can start their complaint journey: the Consumer Support Centre jointly established by the industry, the NCAC, and the MIC complaint hotline. More starting points can provide more choices for consumers but it can also create uncertainties as to ?which one should I go for?? So, without a clear guidance for consumers in the first place, merely providing different channels to consumers may work negatively in practice. Compared with the scheme in Japan, Korea?s scheme appears to be simpler, easier and more user friendly. In Korea?s scheme, the KCA plays an important role: it serves as a key contact for consumer disputes, it provides consumer counseling as well as redress, and it also provides assistance for consumers to file civil litigation against non-compliant companies. In this regard, it can be considered as a ?one-stop shop? in handling consumer complaints. As a multi-cultural country, Australia?s population has a great diversity. It is therefore vital to increase the accessibility of the consumer scheme by providing language services. The TIO has done well in this regard. This is, however, not a particular concern in the case of Japan and Korea. The other goal that the TIO has achieved is its accessibility for disadvantaged and vulnerable populations. This is done through the design of the TIO?s new website, and the TIO?s relay service and teletypewriter service. In comparison, neither the NCAC in Japan nor the KCA in Korea provide comparable services. In relation to the time limit for accepting complaints, the TIO accepts complaints for up to two years after the date that the consumer discovered the problem they are complaining about. In certain situations, the TIO also accepts complaints for up to five years (Telecommunications Industry Ombudsman, TIO, 2014a). In the view of the author, this two- to five-year time period certainly constitutes an extremely wide time limit, especially for communications complaints, which might, in turn, unnecessarily limit the operation of the providers (Li, 2014: pp. 151 ? 168). Nonetheless, this wide time limit doubtlessly contributes to a higher level of accessibility of the scheme. In comparison, the time limits set by the NCAC and the KCA are not clearly specified anywhere. One strong opinion from the author?s interviews in both Japan and Korea indicates that the mainstream industry (big companies) is highly satisfied with the level of customer service that they are providing. As the result, major companies are arguing that consumer complaints have been, and can still be, well handled by companies themselves. ?Japanese society is a special society where nobody likes to make complaints. Yes, people get unhappy about something. But people prefer to talk through it themselves a lot more than finding another place to complain ? this is the culture of the Japanese and this is the culture of many Japanese companies?? (Yoshiyuki et al, 2014). Mr. Eiji Matsuoka, Manager of Corporate Strategy/Planning department in DoCoMo stated: ? ?we are a big company with 63 million active subscribers. Our customer service is key to driving our performance because we know for sure that if they are not happy they will move to our competitors immediately. However, I never thought communications consumer disputes is a big issue in Japan from my experience ? I genuinely do not think we need any other consumer scheme to deal with consumer issues in communications. We always make sure our consumer care is accessible so I do not see the problem? ? ?? we have about 10 million subscribers for main business in NTT. NTT East receives about 700 inquiries every day including general inquiries and sometimes complaints. We have a team of 18 people dealing with consumer issues specifically but we always solve the problem quite quickly, either on the phone straight away or within one day. It is very rare to face the situation that we have tried to solve the problem but our client is still unhappy. This situation probably happens once a year or once every few years?? (Oonawa et al, 2014). Interestingly, all of these statements were verified and confirmed by a number of non-company interview participants including communications attorneys and academics (Sugaya & Higashihira, 2014; Takahashi & Arimoto, 2014). ?? as being the largest operator in Korea, we have 28 million subscribers and do not normally have unhappy customers. We pretty much solve all the consumer issues within 24 hours ? we do not give reasons to our consumers to be unhappy about us ? competition is robust and we can only survive if we provide the highest level of consumer service ?? and ?customers can access our customer care around the clock ? KCC can get vigorously involved if there is any issue ? we don?t really see the need to change anything currently?? (Choi & Tae Kim, 2014). Again, these statements were further confirmed by other interview participants including Prof. Ahn and Prof. Kim (Ahn, 2014). So, the very argument that the industry in Japan and Korea is putting forward during the interviews is that, simply, accessing dispute resolution with companies by consumers has never been and will not be an issue. Nonetheless, Mr. Kamiya from the MIC still believes that there are issues in consumer dispute resolution in Japan apart from those ?naughty doggy companies? and that these issues need immediate attention from the entire industry and the regulator (Kamiya, 2014). The OECD Guidance suggests that a consumer protection enforcement authority should be set up to have the ability to take action and obtain or facilitate redress for consumers, including monetary redress. The TIO has significant authority in making decisions by using monetary redress. It has the authority to decide the resolution of a complaint (which companies are legally obliged to implement) up to $50,000, and make recommendations on complaints up to $100,000 (TIO, 2015k). To the knowledge of the author, the amount of the TIO?s monetary redress is far bigger than many other similar authorities in the world (Li, 2014: pp. 151 ? 168). The current Japanese scheme heavily relies upon private negotiation between consumers and service providers. The NCAC?s role and function are limited to being a mere ?counsellor? to consumers in the negotiation process due to a lack of authority in decision-making. By the same token, the KCA?s decision-making power is comparatively clearer than the NCAC?s, which is demonstrated by the KCA?s dispute resolution team, CDSC. The KCA has been known as the number-one choice for consumer disputes in Korea for years, and, as specified previously, the CDSC normally starts mediation 30 days after the conciliation fails and makes a mediation decision on the dispute. Mediation decisions made by the CDSC have the same judicial effect as a court of law, and if the business does not comply with the mediation decision, the court can order the Execution of Judgment. The CDSC also has a panel of 30 attorneys to provide legal assistance to consumers in case of non-compliance by companies (KCA, 2013a). Although the amount of monetary redress is not specified on the CDSC?s website, it is still rational to assume that the CDSC?s mediation decision can be regarded as a decision with reasonable weight, due to the follow-up legal assistance to the consumers and so on. The OECD Guidance suggests a variety of roles and functions for its member countries, in which ?collecting consumer complaints and analysing marketplace trends? as well as ?enhancing education and awareness? are two main roles that the consumer scheme should play. In regard to ?collecting consumer complaints and analysing marketplace trends?, not only should the member countries have systems in place to collect consumer complaints and, where necessary, analyse marketplace trends; member countries should also consider opportunities for the collection and exchange of information from foreign consumers in developing their systems, and should consider the feasibility of using existing databases for such collection and exchange. In regard to ?education and awareness?, the OECD suggests to its member countries to co-operate with businesses, industry groups, and consumer groups in furthering consumer and business understanding of how to avoid disputes, of dispute resolution and redress mechanisms available to consumers, and of where consumers can file complaints. Moreover, special consideration should be given to the needs of disadvantaged or vulnerable consumers in designing education and awareness initiatives (OECD 2007). All three schemes have done well in this regard. The TIO publishes consumer complaints data and marketplace trends mainly through its annual report (TIO, 2015c). It also publishes quarterly statistics together with the relevant analysis (TIO, 2015j). The TIO does outreach activities on a regular basis, such as attending community events. For instance, a total of 12 outreach activities are planned during March to October 2015 (TIO 2015). In addition, the TIO also sponsors a small number of events or activities staged by intermediary organisations, mainly to improve its accessibility to disadvantaged and vulnerable consumers (TIO, 2015f). Moreover, the TIO communicates with the industry through its industry engagement activities. The TIO has an industry engagement team where a group of TIO staff are made available to provide information on the TIO?s processes, to offer training and information about consumer complaints, and to arrange guided visits to the TIO for companies to familiarise themselves with the TIO?s work (TIO, 2015e). The NCAC, as a cross-border consumer body funded by the Japanese government, clearly specifies ?public relations, publications and surveys? and ?education & training? as two of its seven main activities (NCAC, 2003a). The NCAC collects consumer complaints, analyses marketplace trends, and releases relevant consumer information through various methods such as publications, its website, and leaflets. The NCAC?s publications include the journal specialising in consumer affairs ?Gekkan Kokumin Seikatsu? (People?s Life monthly magazine) and ?Kurashi no Mamechishiki? (Useful Day-to-Day Tips) containing easy-to-understand tips and information useful for everyday life, as well as ?Shohi-Seikatsu Nenpo? (The Annual Report on Consumer Affairs) (NCAC, 2003b). In fact, statistics collated by the NCAC regarding telecommunications consumer complaints form a vital part of the overall collection and analysis of the market trends by the Japanese industry regulator, MIC (Kamiya, 2014). In regard to education and awareness, the NCAC runs a variety of training courses nationwide, targeting administrative officers of local authorities handling consumer affairs, consumer counsellors, people aspiring to become consumer counsellors, private corporation employees engaging in consumer affairs, and teachers. These training courses are designed to provide knowledge concerning consumer affairs, skills to handle consumer consultations and to provide useful information to consumers. In addition, the NCAC also certifies consumer counsellors through a qualifying examination. The examination is given nationwide annually to improve the capacity and quality of counsellors and to obtain new counsellors (NCAC, 2003c). The KCA does equally well on this point. The KCA specifies seven main roles and functions of the organisation, three of which relate to information analysis and education. They are ?publication and information provision?, ?collation and assessment of safety information?, and ?consumer education and training? (KCA, 2013b). The KCA communicates to consumers and companies via both online and offline methods. There are two interactive web portals set up for communication purposes: one is the main website of the KCA (KCA 2013) and the other one is a website dedicated for consumer safety (KCA 2015). The KCA also has a physical library where regular periodicals, independent articles, research institute publications, statistics, dissertations, research reports, CD-ROMs, and all other publications are held (KCA, 2013c). One thing that the KCA does particularly well is its ?education and awareness? activities. The KCA develops customised education programs for consumers by providing education and training for schools, consumers, enterprises and the government. Pilot school and college education programs help students develop rational consumption behavior. Education and training also encourages consumer-oriented management from businesses and helps the central and local governments to promote consumer-oriented policies. In doing so, the KCA also develops and provides educational materials and online contents. In 2006, the KCA developed the ?Appropriate Consumption Life? which is used as an elementary school textbook. Moreover, the KCA operates Consumer TV to better inform consumers. An online broadcasting program called ?Consumer TV? was launched by the KCA in 2005. A year later, in 2006, the KCA has begun to provide services through major portal sites. Consumer programs are broadcasted in KTV and cable channels. Nowadays, CDs produced by the KCA are widely used in elementary, middle and high schools, universities, civic consumer organizations and local governments in Korea (KCA, 2013b; Kim 2014; Choi 2014). With this level of education and various awareness activities, it is most likely that the KCA is known to the majority of the Korean population, and so has become the first choice in consumer dispute resolution in the country. ensuring that consumers are informed about potential security and privacy challenges (ITU, 2013d: pp. 19 ? 21). To conclude, the author chooses a star-rating approach and the table below is designed with star-ratings together with a brief explanation as to what can be done by each of these three schemes to develop and/or maintain a consumer protection framework that is fit for purpose. This paper is only a snapshot of comparable schemes so it cannot reach comprehensive conclusions, but hopefully provides a useful starting point for future discussion. Widen outreach activities to younger generations, such as organising information sessions suitable for school kids. Create a more specific and accessible method between the consumer authority and consumers, especially for consumers with disability and special needs. Consider setting up a sub-division or specialised team in the KCA to deal with communications consumer disputes given the already large and growing population of communications consumers. Create multi-platform consumer communications by-products in non-traditional forms such as interactive CDs and Apps. Consider creating a unified consumer ADR authority with clearer roles/functions, ideally with the power of monetary redress. This can be a governmental agency (such as a sub-division in the NCAC) or an independent body established by the industry (such as the proposed industry consumer support centre in the new industry framework) so the complicated consumer scheme can be made clearer, easier and simpler. 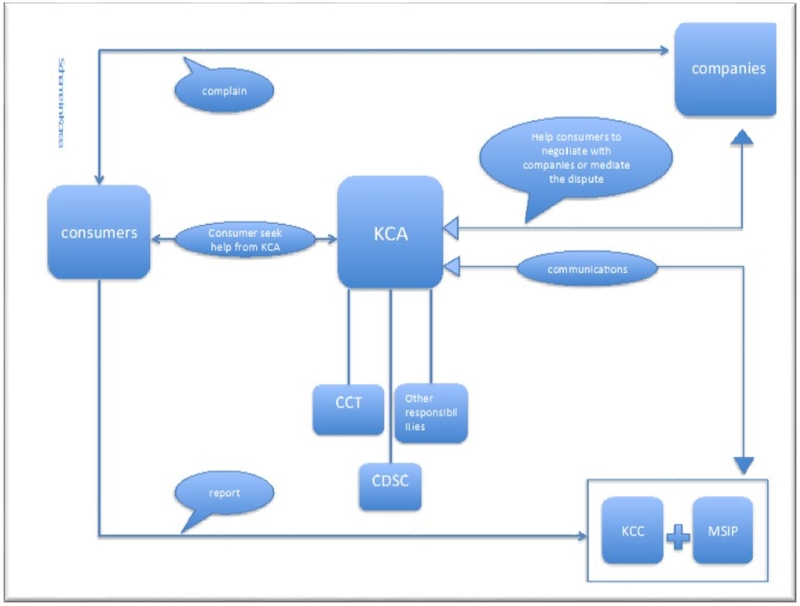 The current one-stop-shop of the KCA and its CDSC is a good approach. The power of the KCA can, however, be strengthened by more regulatory support by relevant industry authorities such as the KCC and the MSIP. For instance, instead of pursuing the judicial system, industry regulators can impose certain license conditions or issue regulatory orders in non-compliance cases when needed. This approach might need certain law reform but it will likely reduce the burden of the judicial system and the overall long-term cost of communications consumer dispute resolution. Improve education and awareness of the scheme to both the consumers and the industry. The KCA demonstrates a best practice in consumer education and awareness, which can be well modelled by countries lacking experience in doing this. Maintaining the level of activities is the only suggestion to KCA in this regard. Li, G. (2014). A comparative study of the communications consumer dispute resolution schemes in the UK and Australia. Media and Arts Law Review, 19, 151 ? 168. Telecommunications consumer protection, MIC, November 2013, Consumer Policy Division, Telecommunications Business Department, Telecommunications Bureau, MIC. Ahn, J. J. (2014, 22 September). Personal communication. This is a 120 minute interview with Prof. Jamin Jungmihn Ahn, from Division of Law, Hallym University. This interview was jointly conducted with the interview with SKT at 10am on 22nd September 2014 in SKT Tower, Seoul. Choi, J; Tae Kim, H. (2014, 22 September). Personal communication. This is a 120 minute interview with Mr. Jeff Choi, senior manager in SKT?s corporate relations division and Mr. Hyun Tae Kim, manager of the Consumer Experience Management Office in SKT. This interview was conducted at 10am on 22nd September 2014 at SK-T Tower, Seoul. Prof. Ahn also attended this interview. Choi, J. (2014, 23 September). Personal communication. This is a 120 minute interview with Mr. Jaeweon Choi from Tek & Law, a legal attorney specialising in IT and IP. This interview was conducted at 1pm on 23rd September 2014 in Tek & Law, Seoul, Korea. Kamiya, M. (2014, 26 September). Personal communication. This is a 90 minute interview with Mr. Masahiko Kamiya, Deputy Director, Telecommunications Consumer Policy Division, Telecommunications Bureau, MIC, Japan. It was conducted at 10am on 26th September 2014 in the premises of theMinistry of Internal Affairs and Communications (MIC). Kim, D. (2014, 22 September). Personal communication. This is a 60 minute interview with Prof. Kim who is a professor of media and IT at Inha University in Korea. Before joining the university, he worked as a senior research fellow for the Korean Broadcasting Commission, a regulator of broadcasting industry, from 1994-1996, and from 1996-1999 as a director of broadcasting policy and convergence policy with KISDI (Korean Information Strategy Development Institute), a government sponsored think tank on IT and media. Professor Kim served as a Korean government delegate for the OECD and the ITU. He also served as a research director for the Korean Society for Journalism and Communications Studies and Korean Association for Broadcasting and Telecommunications Studies, respectively. Prof. Kim is currently a member of National Economic Advisory Council as an advisor to the President of Korea for Creative Economy. This interview was conducted at 4pm on 22nd September 2014 at Seoul Conventional Centre. Oonawa, K; Hatakenaka, M; Matsuoka, E; Ootsuki, M. (2014, 26 September). Personal communication. This is a 100 minute interview with Mr. Kousuke Oonawa, Associate Manager, Corporate Strategy/planning department, NTT East; Mr. Hatakenaka, Manager, customer care, NTT East; Mr. Eiji Matsuoka, Manager, Corporate Strategy/planning department, DoCoMo; and Ms. Memiko Ootsuki, Assistant Manager of Carrier and Regulatory Affairs Office, DoCoMo. This interview was conducted at 3pm on 26th September 2014 at Mita Campus, Keio University, Tokyo, Japan. (This interview was jointed conducted with the interview with Prof. Sugaya from Mediacom Keio University). Sugaya, M; Higashihira, F. (2014, 26 September). Personal communication. This is a 100 minute interview with Prof. Sugaya from Mediacom Keio University and Ms. Fukumi Higashihira, PHD Candidate, Keio University. This interview was conducted at 3pm on 26th September 2014 at Mita Campus, Keio University, Tokyo, Japan. (This interview was jointed conducted with the interview with NTT East and DoCoMo). Takahashi, I; Arimoto, M. (2014, 25 September). Personal communication. This is a 60 minute interview with Mr. IKuo Takahashi, an attorney and the founder of Komazawa Legal Chambers who has been practising as a telecom lawyer for years; and Ms. Mayo Arimoto, attorney at Ogawa & Associates Law Office. Both Mr. IKuo Takahashi and Ms. Arimoto were heavily involved in a comparative study on telecom consumer dispute resolution commissioned by MIC in 2013. This interview was conducted at 1 pm on 25th September 2014 at Komazawa Legal Chambers, Tokyo, Japan. Yoshiyuki, K; Yoshiyuki, I; Kouno, H; Takahashi, I. (2014, 25 September). Personal communication. This is a 100 minute interview with Dr. Koseki Yoshiyuki, CEO of Biglobe; Mr. Ishimae Yoshiyuki, Senior Manager in Corporate Management, Biglobe; and Mr. Huuji Kouno, Consumer Department, Biglobe. Mr. IKuo Takahashi, Telecom Attorney, Komazawa Legal Chambers also attended this interview. This interview was conducted at 4 pm on 25th September 2014 at Biglobe Premises. An interpreter, Miss Yanxian Guo, was used to carry out the entire communication during the interview.